Big and bold white gold wedding band with bright edges. Big and bold wedding bands are appealing to a lot of men today. The MAX3510-10GW is a 14kt gold wedding band that is 10mm wide, has bright edges and a frosted finish. Novell can customize our wedding band and wedding ring designs to your specifications, so that your wedding band and wedding ring will be one of a kind. Exactly the way you want it. In different metals (platinum, palladium or gold), different widths, finishes and much more. Customization sets Novell apart from all the rest. White gold wedding band with hammered center and milgrain. 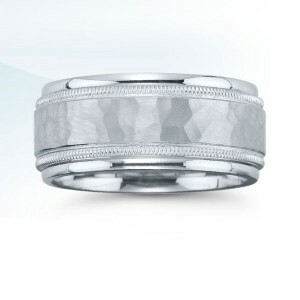 Hammered finishes wear very well on a man’s wedding band. If you are active, you may wish to consider a hammered finish. The MAX3511-10GW is a 14kt gold wedding band that is 10mm wide. Novell can customize our wedding band and wedding ring designs to your specifications, so that your wedding band and wedding ring will be one of a kind. Exactly the way you want it. In different metals (platinum, palladium or gold), different widths, finishes and much more. Customization sets Novell apart from all the rest. 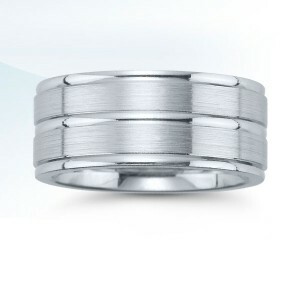 White gold wedding band with beveled edges, grooves and special finish. 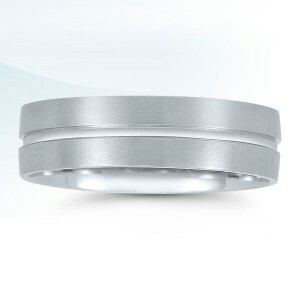 Sometimes a little decoration such as thin grooves and beveled edges makes a nice touch for your wedding band. This design also has a special hand-spun finish. The NS1016-7GCEY is an 18kt gold wedding band that is 7mm wide. Novell can customize our wedding band and wedding ring designs to your specifications, so that your wedding band and wedding ring will be one of a kind. Exactly the way you want it. In different metals (platinum, palladium or gold), different widths, finishes and much more. Customization sets Novell apart from all the rest.